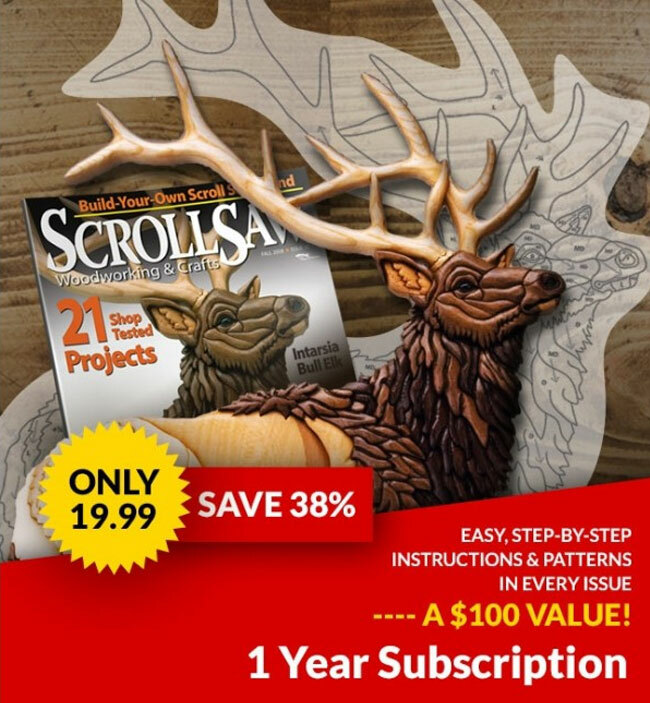 Scroll Saw Picnics are great places to find new projects to keep you busy or gather advice to make your shop time more productive. Over the summer, scrollers across the country had several opportunities to speak with manufacturers, show off their talents and socialize with fellow enthusiasts. 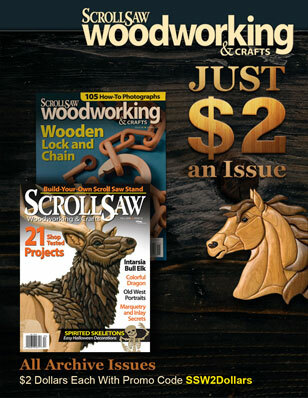 Traditional scroll saw picnics, such as the one started several years ago at Dale Whisler’s farm in Stevens, PA, were held in Phoenixville, AZ, and Harrisonburg, VA. These picnics captured the feeling of those first Pennsylvania Picnics—a place to gather with scrollers, have a nice meal, and show off your work. There were raffles, a show and tell table, food, and fellowship. Several of the other picnics have grown over the years to become more like a trade show. 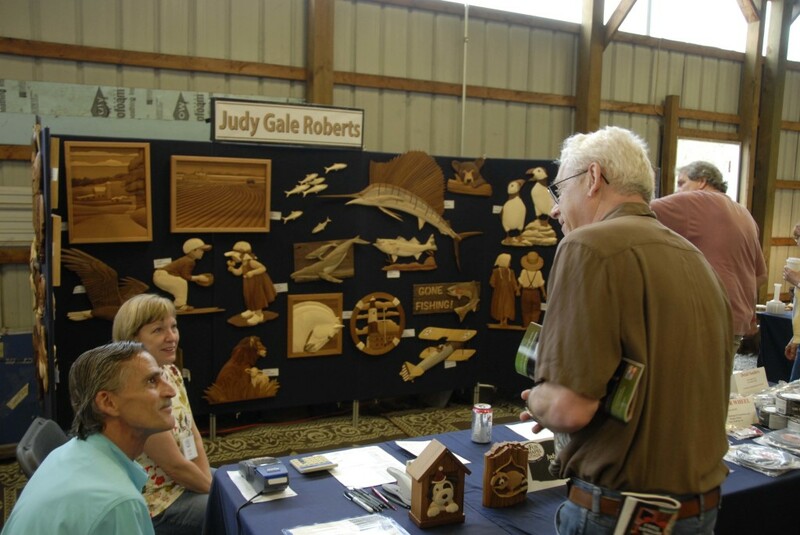 The PA Scroll Saw Picnic, held June 11 in Stevens, PA, was organized by the Tri-County Scrollers. The picnic featured vendors and visitors from across the country. Scroll Saw Woodworking & Crafts held its first “Scroll Off,” a timed competition where participants cut a compound swan pattern from Diana Thompson’s book 3-D Patterns for the Scroll Saw. John Meloling of Baldwinsville, NY, took the prize with a time of 58 seconds. John raced against and beat accomplished author and pattern designer, John Nelson. He was awarded a $50 Fox Chapel gift certificate. Wole Ajala of Mt. Pleasant, TX, took home the prize in SSW’s second “Scroll Off” contest. He raced against scrolling guru Rick Hutcheson and took home top honors by scrolling Diana’s swan in a record time of 28 seconds! Born in England, Wole started scrolling at the age of six, and perfected his skills while his family was in Nigeria doing missionary work. Each sibling had to scroll out a certain number of projects after school before being able to play. That was enough incentive for Wole to become a speed scroller. With his father’s encouragement he began entering and winning arts and crafts contests at the age of eight. Wole is currently a licensed preacher and president of the East Texas Scrollers Association, a chapter of S.A.W. He frequently demonstrates at craft shows and teaches classes for all skill levels. Wole was awarded a $50 Fox Chapel book gift certificate for his record time. 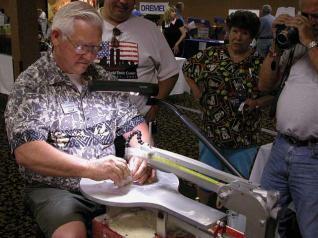 The Mid-West Scroll Saw Trade show was held Aug. 6 in Richland Center, WI. Floyd and Carol Hacker of Ocooch Hardwoods and Dirk and Karen Boelman of The Art Factory organized the event. Instead of a speed cutting contest, SSW hosted a“Scroll a Fox Free-hand” contest. Donna Baltz of Redgranite, WI cut out the Fox Chapel logo the most accurately, without using a pattern, to win a $50 Fox Books gift certificate. In the S.A.W. contest, Peter Menini, of Illinois took home the Best in Show prize for his “Peacock Lamp.” Annja Starrett of Ohio, took home the Peoples’ Choice Award for her “Intarsia Tiger Fish.” Plans are already underway for the 2006 season. Be sure to check future issues of SSW for more details.